If it's Monday then it's always time for Marilyn! Isn't she just so pretty? And I'll bet you can't figure out just who this is right? 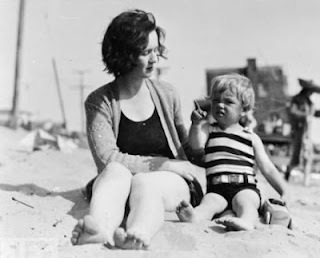 It's 1929 and that's none other than Norma Jean as a child. Isn't her suit adorable? And I'll bet it's wool. Last weekend one of my fabulous finds was this framed print of a Vogue cover from July 1, 1919. 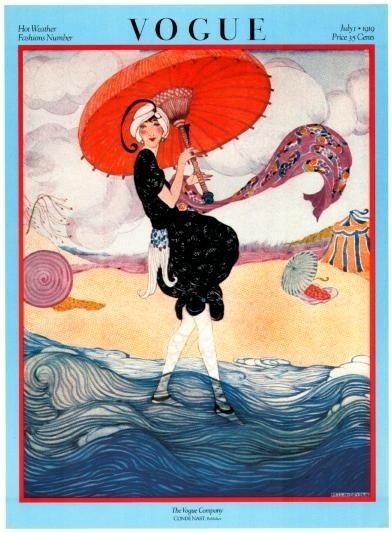 A woman in a black dress, white turban, and printed pink scarf holds an orange umbrella while walking in the surf. Helen Dryden's elaborately imagined beach scene appeared on the July 1, 1919, cover of Vogue. It's pretty special to me. Ok, all I need now is a beach house. I've got plenty of artwork and swimsuits to hang! It was 1948 when this article appeared in Life magazine. 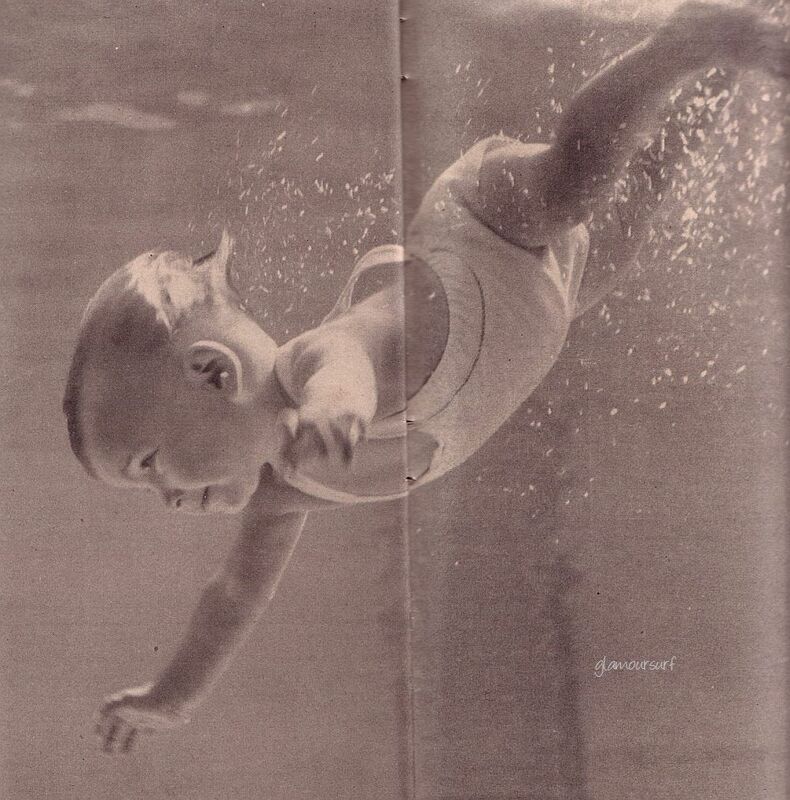 Eleven month old Sherry Lynn Whitford can also dive, even though she is still unable to walk. The wide eyed infant scooting through the water is the worlds most precious swimmer. 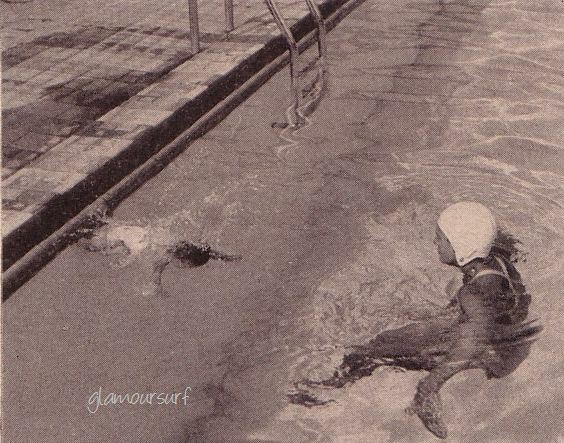 She can't walk but she can swim several times a day as she dog paddles across a 30 foot swimming pool in Los Angeles. Sherry Lynn revealed aquatic talent at the age of 6 weeks, and early instruction consisted of teaching her to use her arms for propulsion. She caught on after they were moved back and forth some 500 times, and she was able to swim for the first time at the age of 7 months. Baby Sherry Lynn Whitford dives 2 feet under water, keeping eyes wide open as she gets ready to paddle back to the surface. Diving was possible after Sherry Lynn had learned to extend her arms to break the shock of hitting water. Instructor Crystal Scarborough, who is Sherry Lynn's cousin, considers her the most promising of 40-odd babies she has taught to swim and thinks she is a sure bet for the 1964 Olympics. 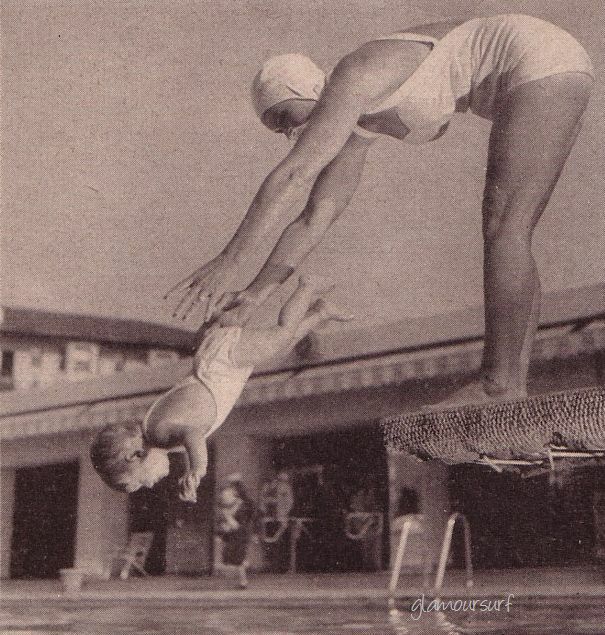 Baby dives by being dropped into the water headfirst by Miss Scarborough. To get into the pool by herself she sits on the edge and simply flops off. Baby swims, she has no sense of direction but will follow instructor. not strong enough to raise up for a gulp of air, she crosses the pool on one breath. Right now exactly one third of Sherry Lynn's vocabulary concerns swimming. She says "Mama," Dada," - "dive." I found a small snippet of her in video form at British Pathe. Enjoy! Marilyn Monrore can make absolutely anything look good. 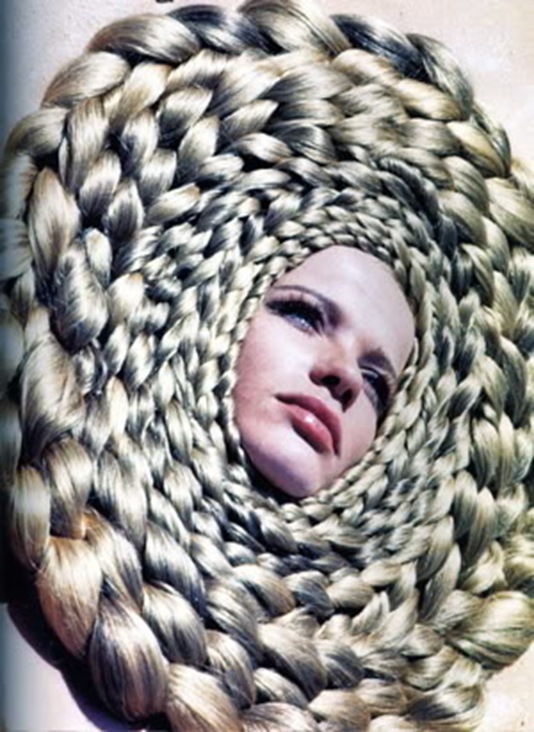 Here she is wearing an outfit made of burlap potato sacks and she looks as captivating as ever. 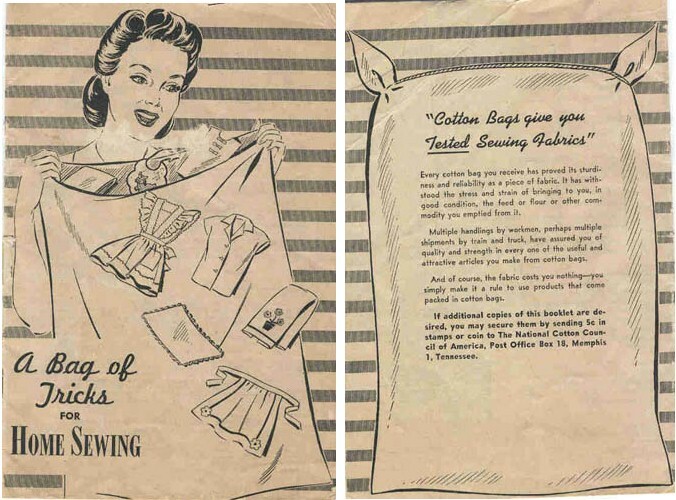 Back in the early years during world war II, our fore mothers would use feedsacks as fabric and fashion them into clothes. Feedsacks have a whole interesting history of their own. 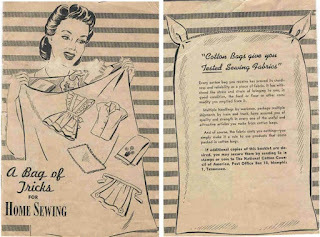 I found Sharons Antiques on line and they offer a simply fabulous variety of feedsack fabrics. 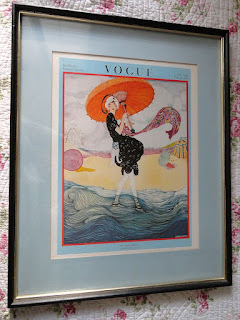 I'm very very tempted to choose one of my vintage patterns over at Glamourstitch and try my hand at this. What would you make? Fabulousness, right? 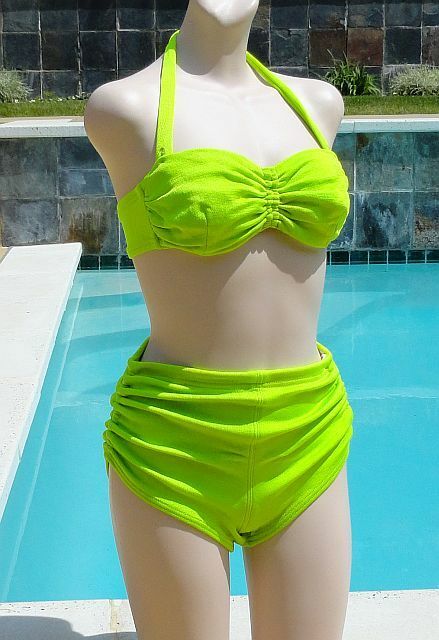 I'm so excited to share this two piece high waist swim suit with you. 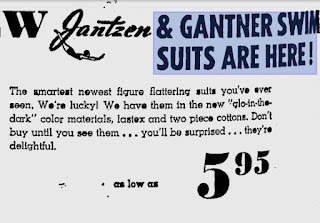 This suit dates to the late 1940s and was made by Gantner. 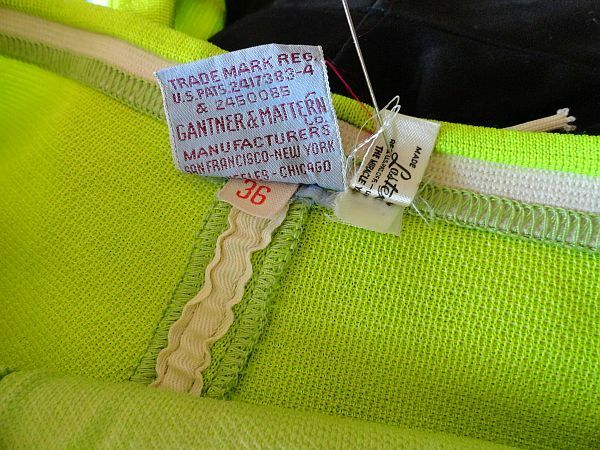 Many people think that these bright neon colors only came out in the 1980s, but they have been around for much longer than that. 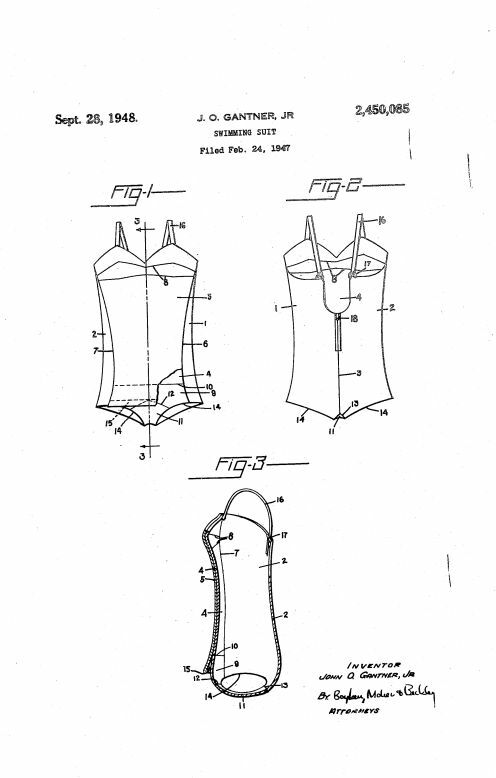 I've been curious about the process, color and naming of this suit so I was tickled 'pink' when I looked up the trademark patents on the label and found some fabulous information. 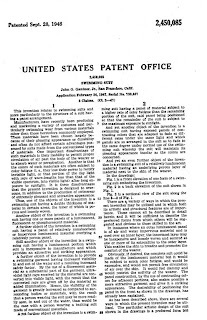 The patent information is available on line, I had to go install an applet to make the images work, and then voila, I was able to copy and show the info to you here. As always, you can click on the image to enlarge it. 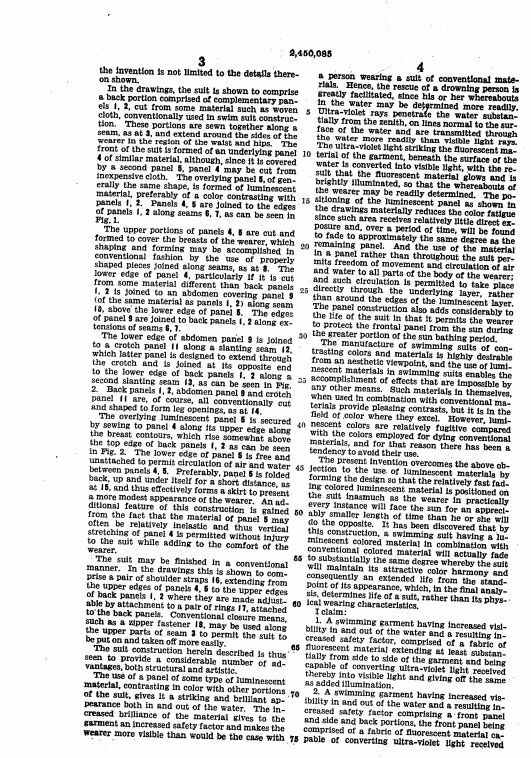 "Another object of invention is a swimming suit having one or more panels of a luminescent fluorescent or a phosphorescent material." "Inexpensive to manufacture, attractive and striking appearance, increased visibility in and out of water, and a resulting increase in safety factor." 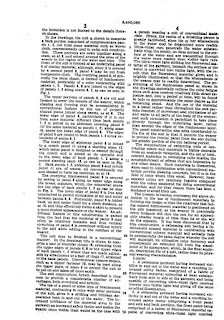 "Because the use of a florescent material as a substantial part of the garment, ultra violet light rays received by the material are converted into visible light, with the result that the converted rays are given off by the material as added illumination." 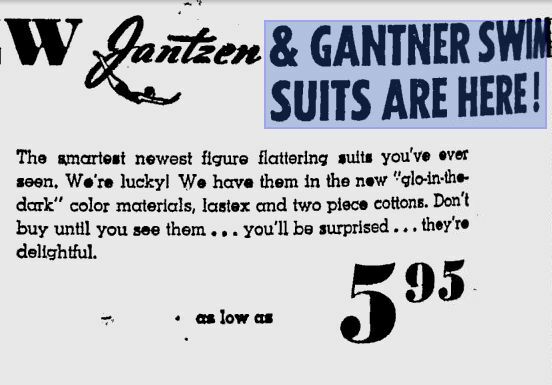 And they were fairly inexpensive in 1948. 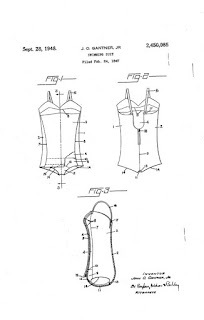 The other patent explains the process and fabric in more detail. So there you go, perhaps more info than you ever wanted, but the info is there if you need it. And for gals like me, I just love it and get all fired up! 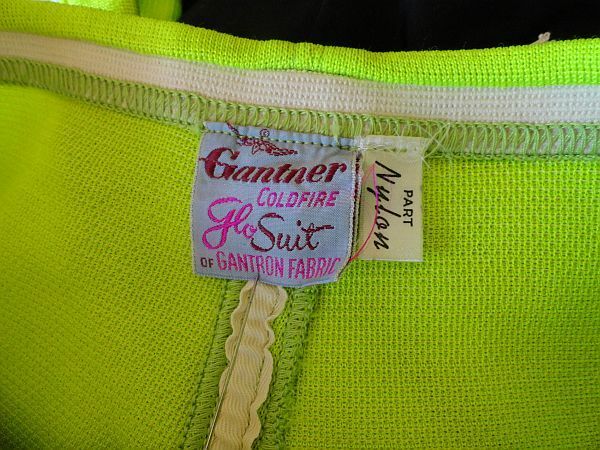 We just listed this swimsuit on Glamoursurf, go have a gander. Oh, and did I forget to mention that the sides of the suit are adjustable? I've been searching and searching for the artist in this picture. 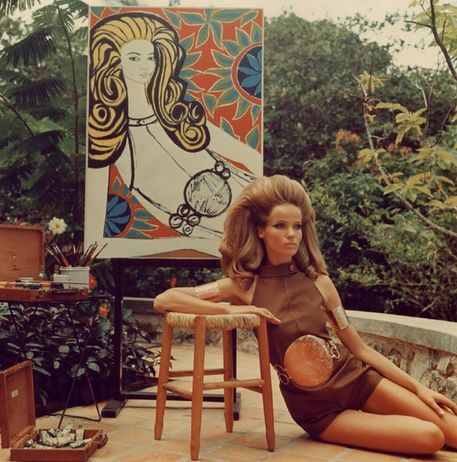 Yes, it's classic Veruschka, and I love her outfit by the way. Does anyone know who the artist who is painting her is? I know the image is from 1967. 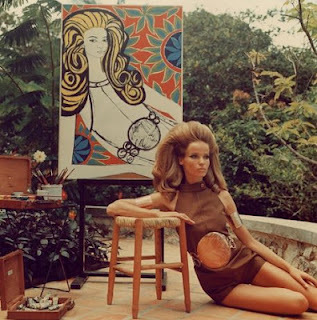 Veruschka took many shots in body paint and got quite famous for it. 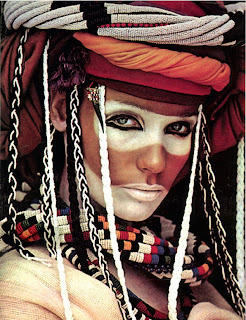 Here is a fabulous video of her in Africa with Peter Beard. 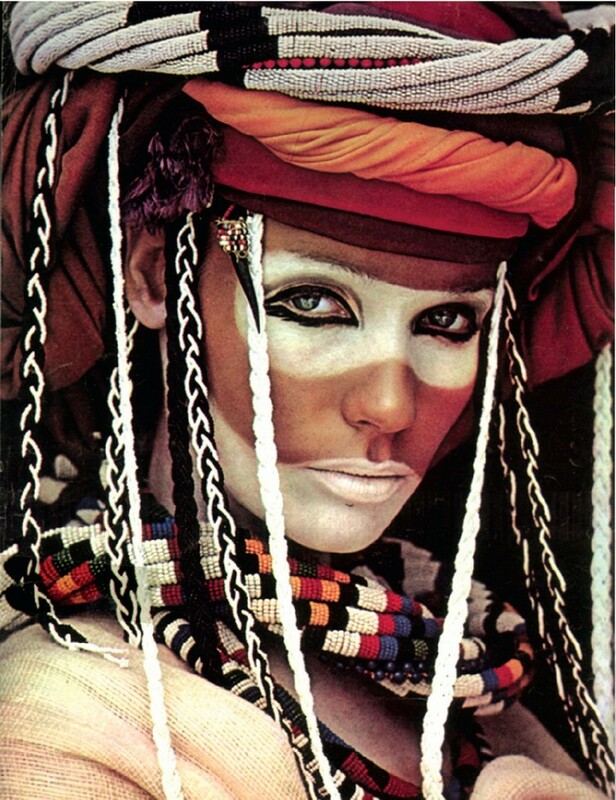 Beautiful body paint here. 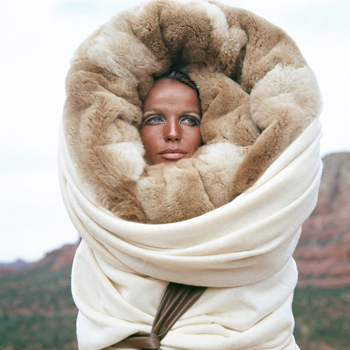 One of the famous supermodels from the 1960s and 1970s was Veruschka, such a compelling face made for lots of interesting photography angles and shots. These area few of our favorites. 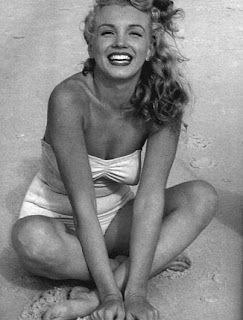 Two images of Marilyn, from the same shoot. 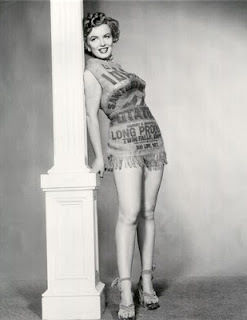 Frank Powolny is credited with the top image so I can only assume the back view of Marilyn is the second picture is by him as well. But that suit with the little bubble bow on the back. I want to learn more about that. Cute right? I don't think I've ever come across anything like that before, but it sure is flirty and feminine at the same time. What do you think? Hula - hooping that is. It's a great way to burn off some calories at the beach and get a flat tummy at the same time. Do any of you hula? Happy Friday all, have a fabulous weekend. Do something fun! 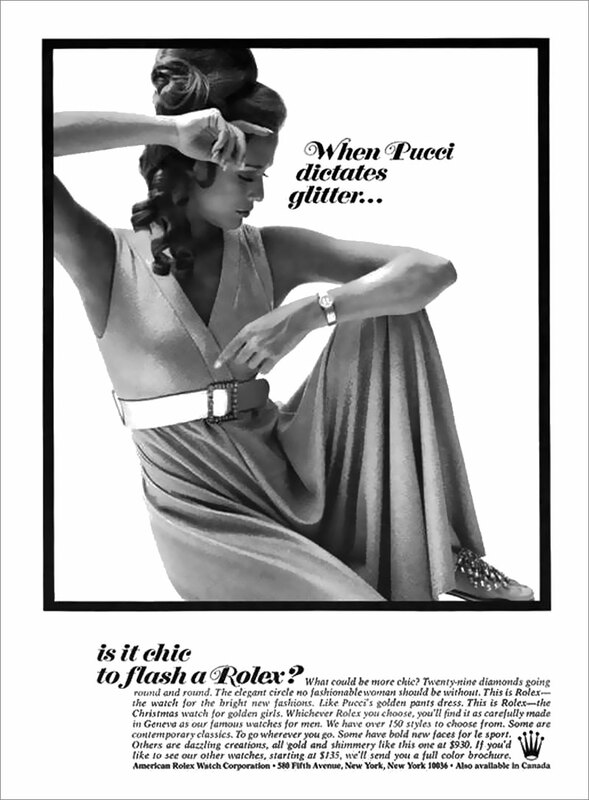 It's no secret that fashion designers have cross merchandised with brands like Rolex to create advertising for products. 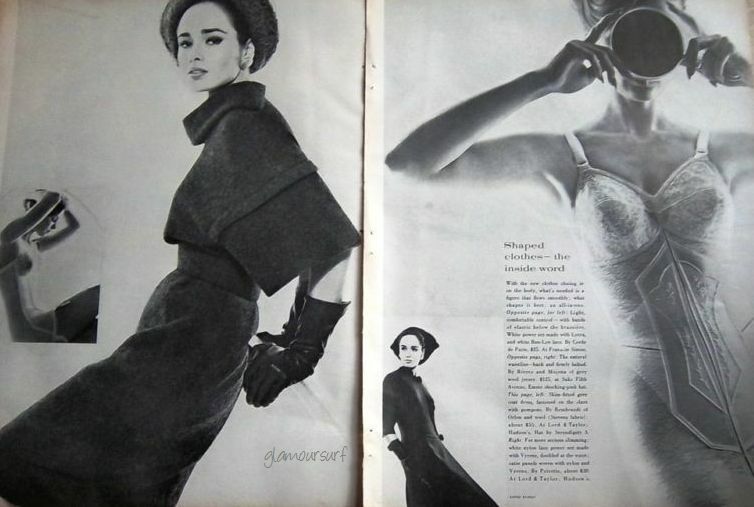 These two ads display that premise nicely.Both are from 1968. 1968 Rolex Ad featuring Rudi Gernreich Swimwear. Want to see more? There's a great post over at the Vogue Italia site that has some really cool images of fashion & watches combined. 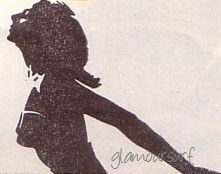 Here's a fun ad from 1963 for Lee Swimsuits. It identifies the fabric as Creslan knit, a miracle of figure moulding. An interesting side tidbit when researching Creslan on Wikipedia, I found out it's an Acrylic fiber which has since ceased production in the US. "All US producers have ended production. 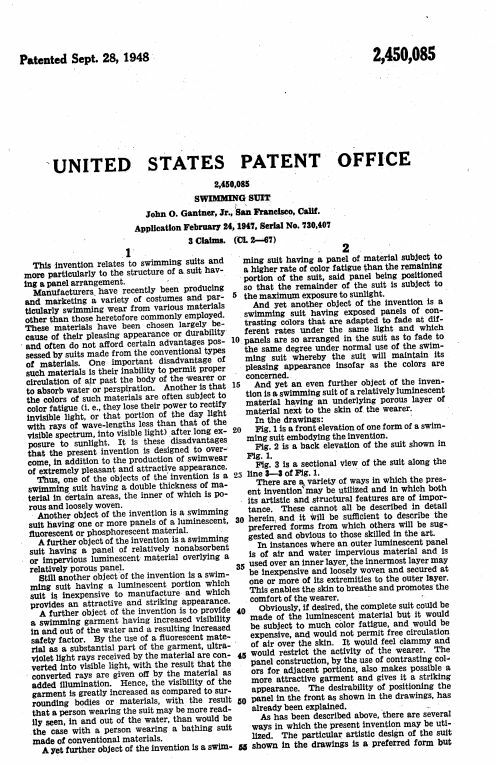 Former U.S. brands of acrylic were Acrilan (Monsanto), Creslan (American Cyanamid), and Orlon (DuPont). Other brand names that are still in use include Dralon (Dralon GmbH)." Love the high waist two piece in white, about $12.00 in 1963 ($90.00 in today's dollar). 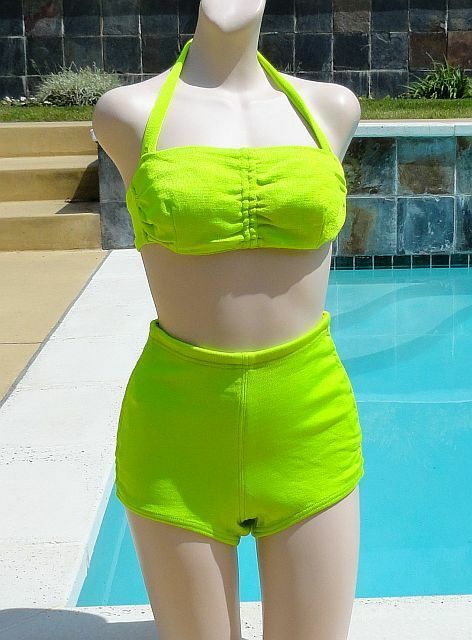 I'm seeing lots of this type of high waist swimsuit being reproduced from today's manufacturers as well, but I prefer the original vintage garments. Something about the fabric, the shapes, the support, the figure enhancing fit and the definitive silhouettes of the periods just can't be matched today. This is a small icon from the ad above. Fun right? This will make it's way somehow into something I do soon. 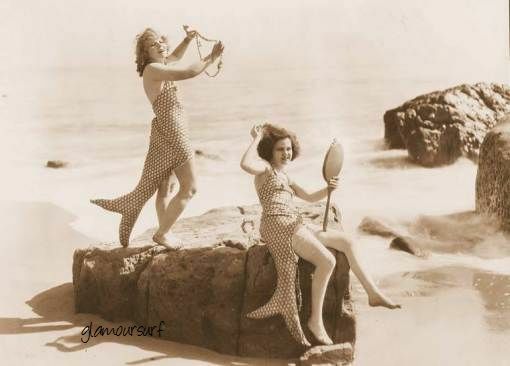 I'm in love with the whimsy of this photo from the 1920s. How about those mermaid costumes? 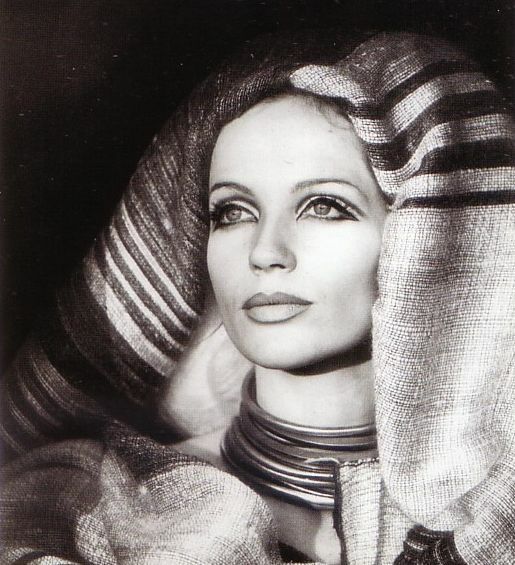 This is Countess di Zoppola in 1935. And this image got me interested to find out more info about her. Turns out she was formerly known as Edith Mortimer, and her friend Cole Porter called her Tookie. A Newport socialite named Miss Edith Mortimer married Count Mario di Zoppola, an Italian aviator, in 1919, at her parents' country home in Wheatley Hills. 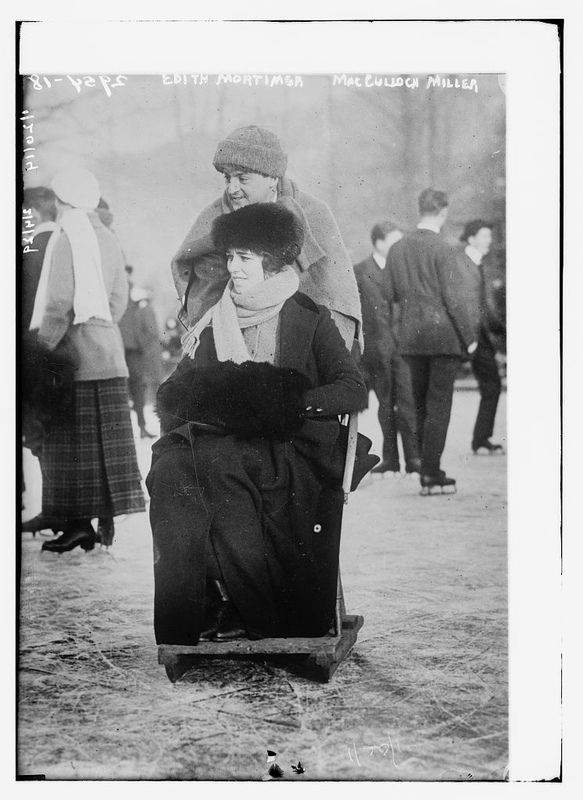 Her mother was Eleanor Roosevelt's aunt. 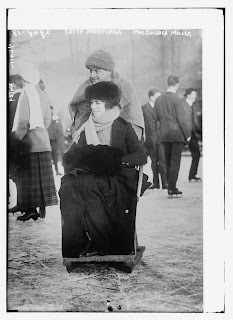 The Count and Countess di Zoppola divorced in Reno in 1929. 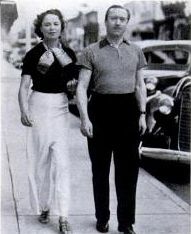 Here she is strolling with Captain Alistair Mackintosh in Palm Beach, 1939. Look at those pants. My how times have changed. I still love the lounging swimsuit shot though, it looks wonderful with that skirt! I'm sharing this clip with you today, the beginning is the best (in my humble opinion) to see some detail on all the fabulous ladies bathing suits. Oh don't they look to be having fun. Enjoy and happy Monday ya'll!